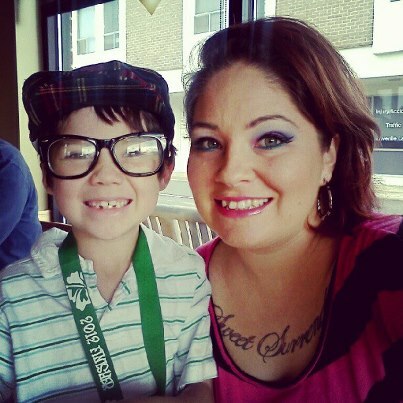 This past Sunday, Matthias and I got the rare chance to have mom and son time. We went to Starbucks and ordered our holiday drinks. He gets his white hot chocolate and I get my Pepermint mocha at kids temperature simply because I hate burning my tongue and waiting for my coffee to get cool enough to sip on. I managed to get a pic of us. He loves his hat! He's had it for about a year now. Its from Target..Harijuku line of course. He snatched my glasses from inside the car and wore them all day. He is soooo stinkin cute. He is alot like me and when I notice lil things that we have in common, it just makes my heart melt. Later, we went to his football banquet party to celebrate the season and to get his trophy. 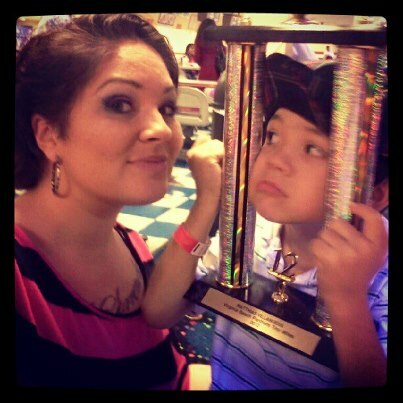 He was so excited to get his trophy and to also go bowling....oh yea, it was held at a bowling alley on base. Many many kids and their parents. It was actually pretty fun. Check out my hot neon bowling rental shoes! 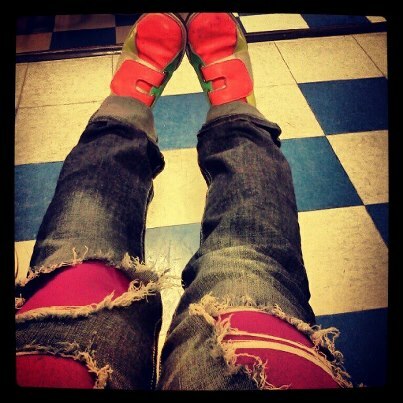 They match my tights under my ripped jeans! I managed to bowl almost a full game before my hip and wrist started hurting. Arabella was excited to go bowling too! She bowled more games than us! She bowled 5 games!!!! Lets just say she was fast alseep as soon as we got in the car. Look how bog his trophy is!!! He was so happy and I couldnt have been more proud of my baby boy. I am glad that he stuck through the whole season and he cant wait for next season! Now, I need to get off this computer and make breakfast for the fam...even though its lunchtime. Tons of stuff to do. Im making my dining room into my art studio and gotta start christmas shopping. I know, I know, its a lil late, but so much has been happening. well, im off to start the day! Keep on looking the brighter side of life, keep on running for the goals in life, keep on searching for the treasure of life, keep on moving forward positively.